Tomasello points out that a lot of social animals can be said to have a culture insofar as the same animal species can live in slighty different habitats and show different behaviours (e.g. chimpanzees of different regions have different pant-hoots, many species have regionally differing techniques for obtaining food). In this regard, human culture is only quantitatively different from that of, say, the other great apes. The difference here is that humans simply have to learn about more culture-specific behaviours and artefacts. The principle however, is the same. human culture is cumulative. That is, artefacts and behavioural practices often become more complex over time. Every improvement or accepted changed will be transferred to the next generation and so forth. human culture is unique in that there are social institutions, which create and enforce culture norms and practices. What underlies these two features “are a set of species-unique skills and motivations for cooperation.” (Tomasello 2009: XIII) on which Tomasello elaborates in the subsequent chapters. In the first chapter, “Born (and Bred) to Help”, Tomasello outlines how children come to be (or already are) cooperative so that they can take part in an co-establish human culture. He advances a theory he dubs “Early Spelke, Later Dweck.”Research done by Tomasello and many others shows that by the time they are about one year old, infants already prove to be cooperative and helpful in many contexts. In addition, these tendencies seem not be taught but come naturally to them given sufficient interaction with a normal environment. (Hence ‘Early Spelke, referring to the work done by Harvard psychologist Elizabeth Spelke on innate or naturally emerging ‘core knowledge’). Later in development however, this picture becomes more complex: children come to be concerned about whether others will reciprocate and also about how they are judged by others in the group. They also gradually internalise cultural norms. Up to now Tomasello has mostly described the initial starting point from which children refine their social behaviour and become truly cultural beings. More precisely, what happens is that children become less ‘indiscriminate’ in terms of who they behave altruistically towards, but become more discerning based on a variety of characteristics. “they are targets of the judgements of others who are using social norms as standards.” (Tomasello 2009: 31). In other words, for the first time they develop a larger we- or group perspective, which is connected to the insight that this ‘we-ness’ is tied to certain social norms (‘They way we do things’). Experiments show that by the age of three children actively follow social norms and also already participate in enforcing these norms. If they grasp how a game works, for example, not only do the play it according to the rules, but they also correct others and object if they try to play the game differently. Interestingly, they also use ‘normative declaratives’ like “One can’t do that” or “It doesn’t work like that,” when doing so. Those findings contrast sharply with Jean Piaget’s influential view of how social norms are internalised. According to him, (and building on the work of Piaget, moral psychologist Lawrence Kohlberg), children follow social norms only because they fear punishment. Instead, from and early age on children already seem to adopt some kind of ‘view from nowhere’ (Nagel 1970) and a “he is me” attitude of identification when interacting with others (see also Meltzoff 2005). “without this added dimension of some kind of ‘we’ identity and rationality , it is impossible to explain take it upon themselves to actively enforce social norms on others from a third-party stance, especially those norms that are not based on cooperation but rather on constitutive rules that are, in an important sense, arbitrary” (Tomasello 2009: 39). For Tomasello these processes form the basis of human cooperative behaviour, cultural transmission, social institutions and cultural practices. Meltzoff, Andrew N. (2005): Imitation and other minds: The “Like Me” hypothesis. In S. Hurley and N. Chater (Eds. ), erspectives on Imitation: From Neuroscience to Social Science. Vol. 2, pp. 55-77). Cambridge, MA: MIT Press. Nagel, Thomas (1970) The possibility of altruism. Princeton, NJ: Princeton Unviersity Press. 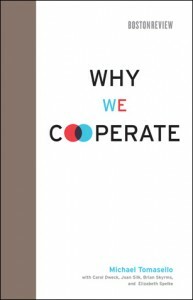 Tomasello, Michael (2009): Why We Cooperate. Cambridge, MA/London, England: Boston Review.